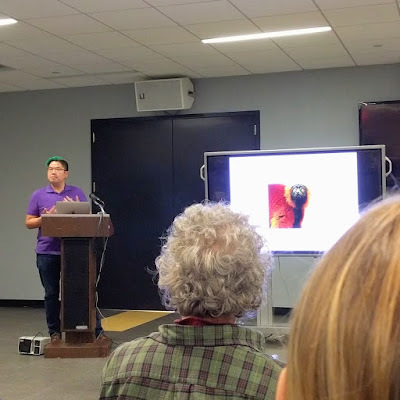 I gave a poster presentation at Northeastern Evolutionary Primatologists (NEEP) earlier this month, held at Hunter College. It's my first time at NEEP and it's nice to see my regional colleagues. And yes, that's a "floating tablet". 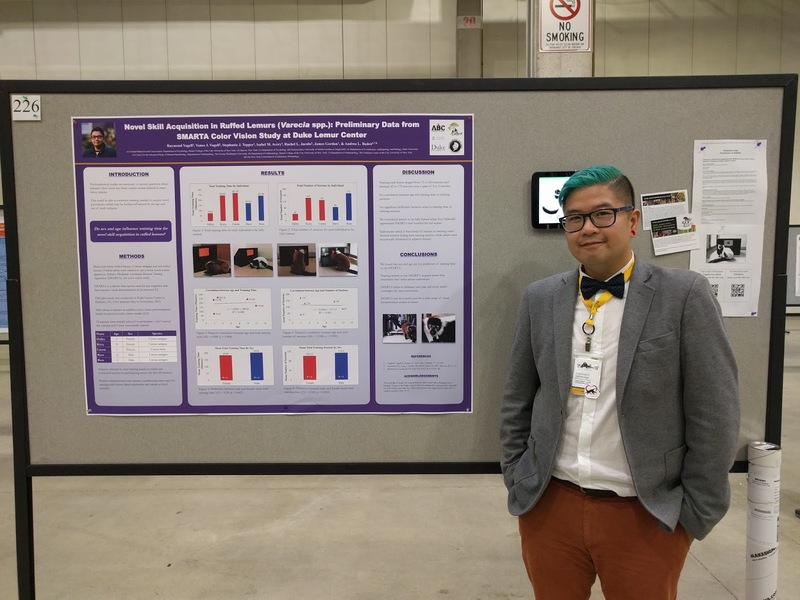 Command Strips are great to affix your tablet during poster presentation. They come off easily after you are done! 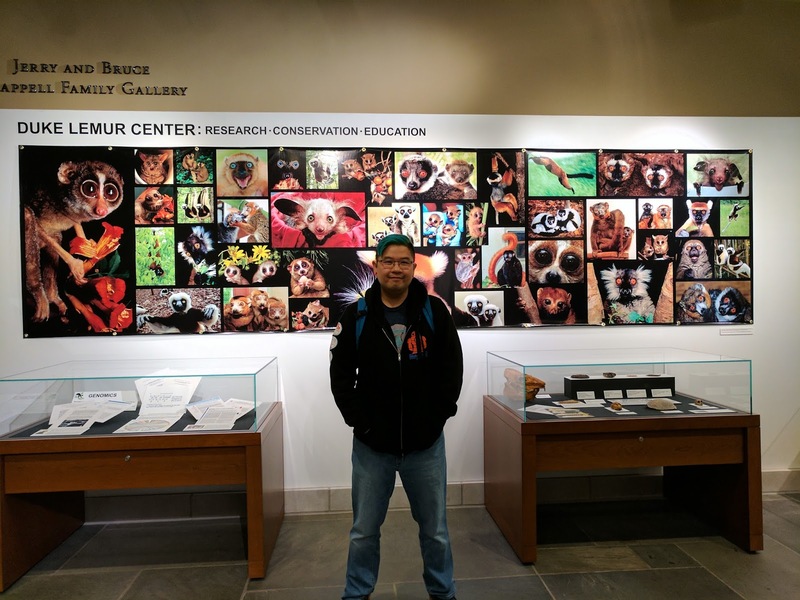 Northeastern Evolutionary Primatologists (NEEP) is the northeast "chapter" of primatologists that focus on evolution, ecology, and behavior. You can read more about this organization on their website, as well as on their Facebook group. I also gave a short talk on my ruffed lemur color vision research for my department's Pre-Graduation event. This is the first time I actually presented with my preliminary data. I'm right on track for graduation next Spring. 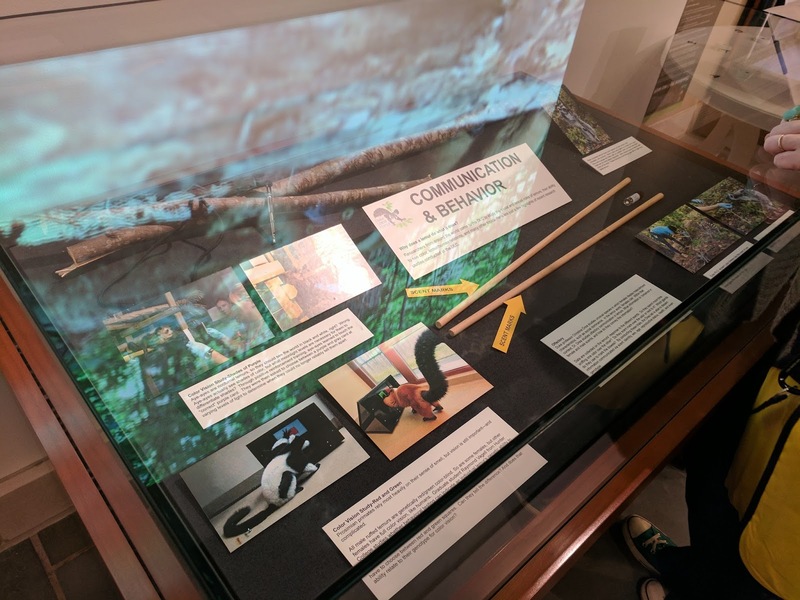 The Animal Behavior and Conservation Program at Hunter College is offered as a Master's Program for those that are interested in behavior, evolution, conservation, welfare, and cognition. 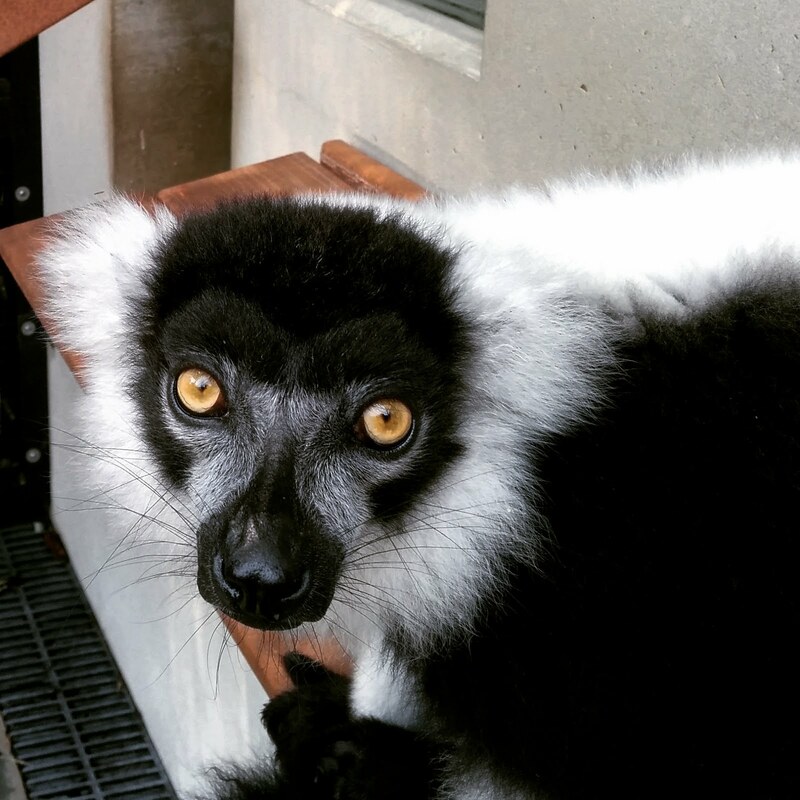 We said goodbye to Magellan this week as he transitioned into the next chapter of his life at Dickerson Park Zoo --- fatherhood (hopefully!). I can't wait to see him in his new environment so hopefully one of these days, I'll plan a trip out to Springfield, MO. Bon voyage, Magellan! 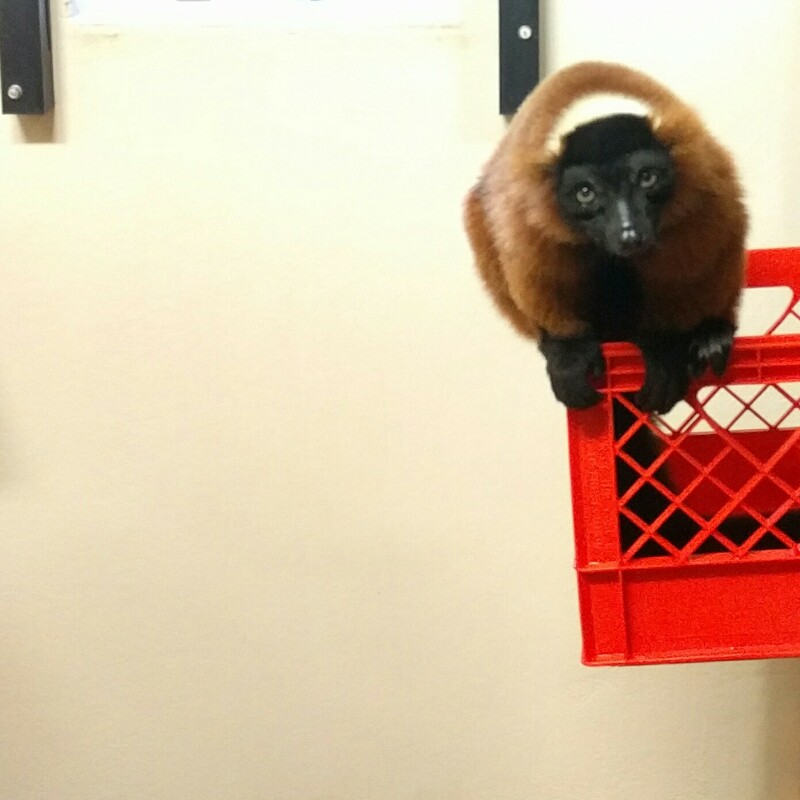 BUT WHY IS MAGELLAN LEAVING THE DUKE LEMUR CENTER? According to the Duke Lemur Center, Magellan's mother and brothers were acting aggressively towards him. This is actually a natural phenomenon. 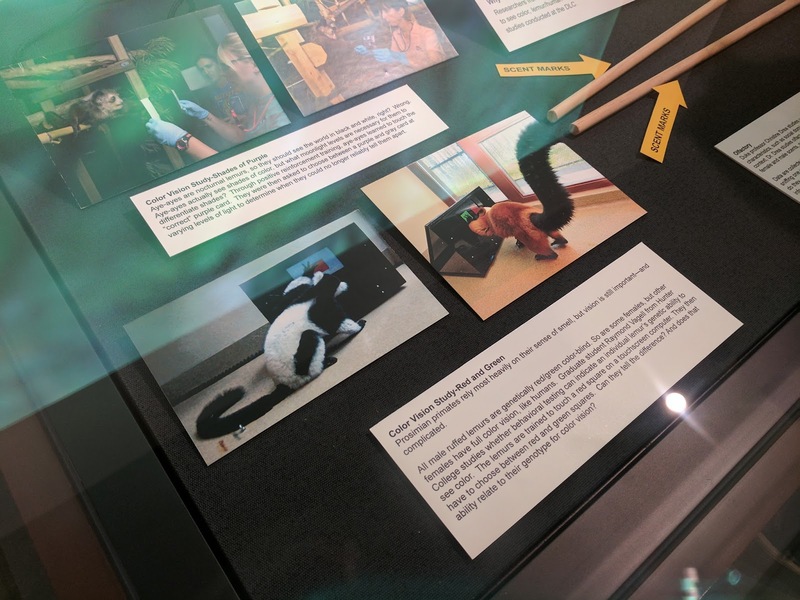 Lemurs are "kicked out" of their natal group at a certain point of their life, and this is induced by aggressive behavior towards the lemur individual. This is a common mechanism for animals that dispersal. Literally getting the boot from the group. 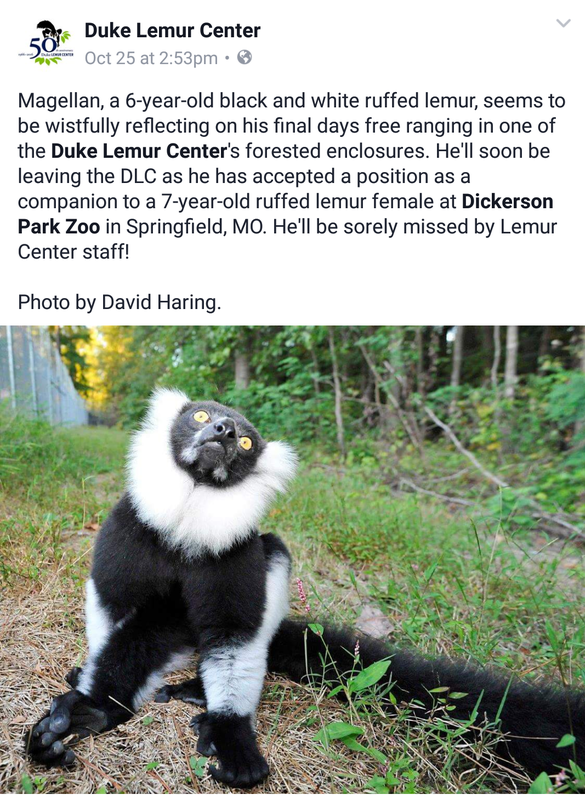 There are no helicopter parents in the lemur world. Ruffed lemurs live in a fission fusion group, so generally both sexes are kicked out of the group. Magellan was one of my research subject at the Duke Lemur Center. 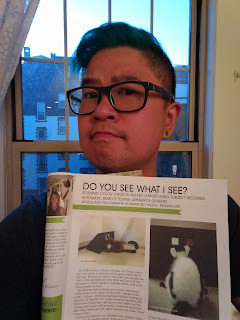 Along with his brothers (AJ and Rees) and mother (Kizzy), they participated in my color vision study last summer and fall. My poster for Duke Lemur Center 50th Anniversary Scientific Symposium is now available online. Please click here. 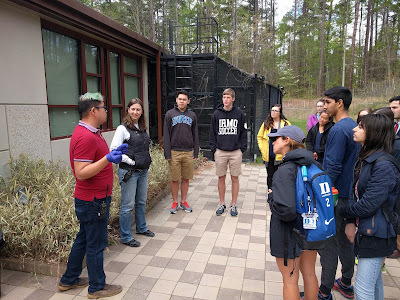 Thank you Duke Lemur Center for inviting me to present my research, especially Dr. Erin Ehmke. 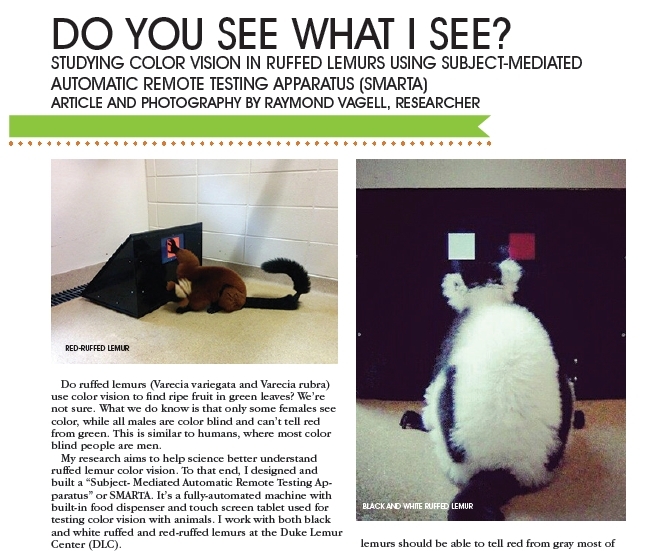 Polymorphic color vision in ruffed lemurs (Varecia spp.) occurs due to an allelic variation of a single x-linked opsin gene that results in individuals being either dichromatic (red-green colorblind) or trichromatic depending on their opsin genotypes. 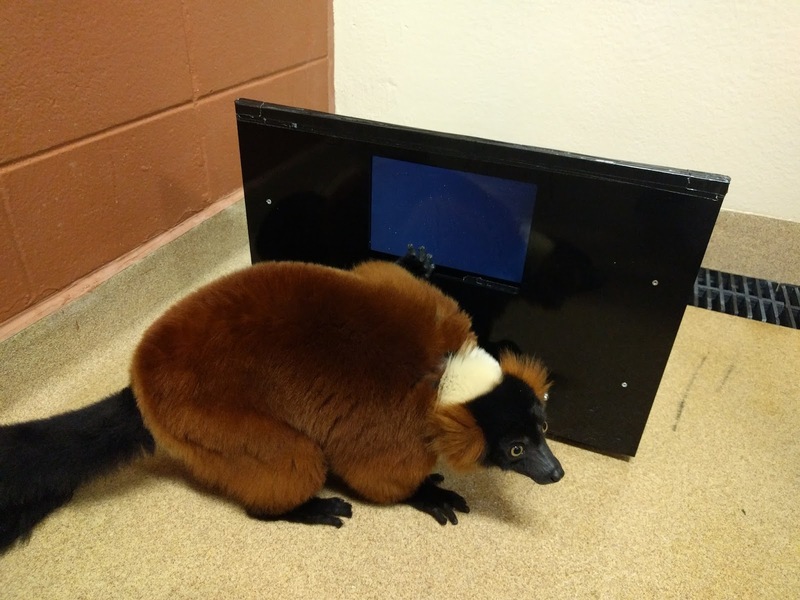 The link between genotype and phenotype is well-established in haplorhines but not well-studied in lemurs. 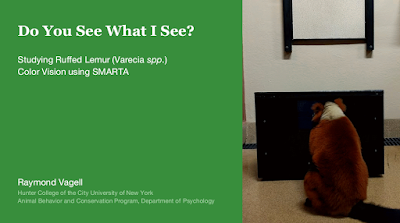 To investigate the color vision genotype-phenotype link in Varecia spp., the subject-mediated automatic remote testing apparatus (SMARTA) was developed. 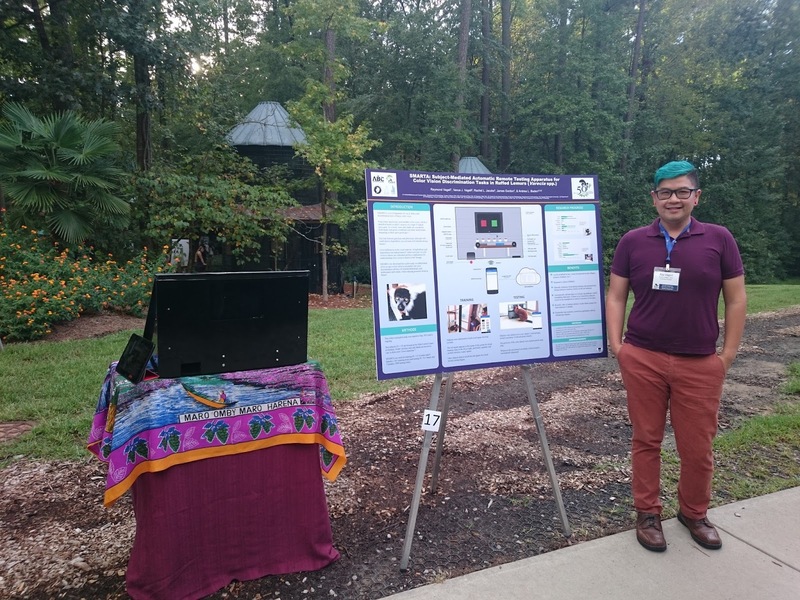 It aims to reduce biases and to accurately test the color discrimination abilities of inferred dichromatic and trichromatic individuals. SMARTA is an innovative novel apparatus for behavioral touchscreen discrimination tasks. It is controlled remotely via a smartphone app, has a motorized conveyer that automatically dispenses food rewards, automatically logs data online, and is relatively inexpensive to build. Early last week, Duke Lemur Center celebrated its 50 year anniversary with a Scientific Symposium and Gala. 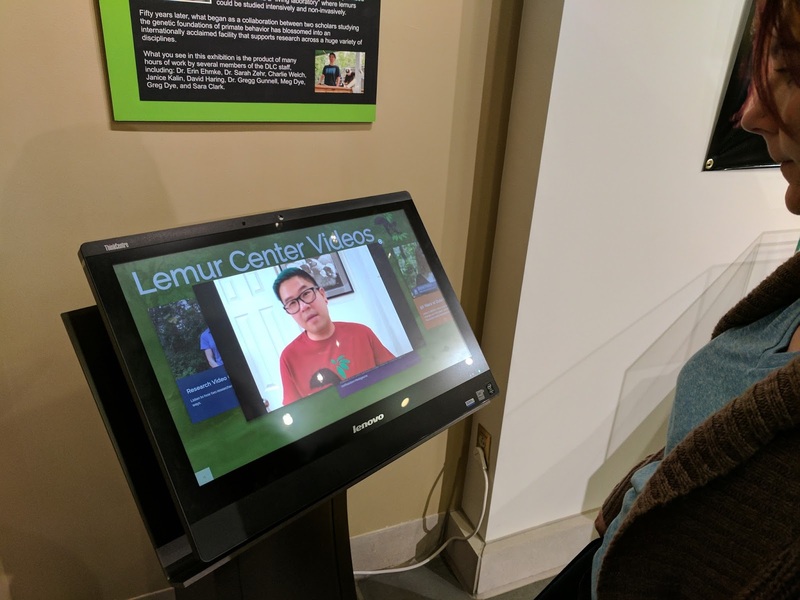 Originally called Duke University Primate Center, it was renamed to Duke Lemur Center to reflect its scientific mission and, well, the fact that most of the residents in this facility are lemurs. Some slow loris and bush baby do call Duke Lemur Center their home. I was fortunate and humbled to be invited to present my research at the poster session as well as doing demonstrations of my research. It's exciting to see that SMARTA and my ruffed lemur color vision study continue to engage and excite many people. Who says you can't do fun science that's engaging to BOTH the public and the lemurs? 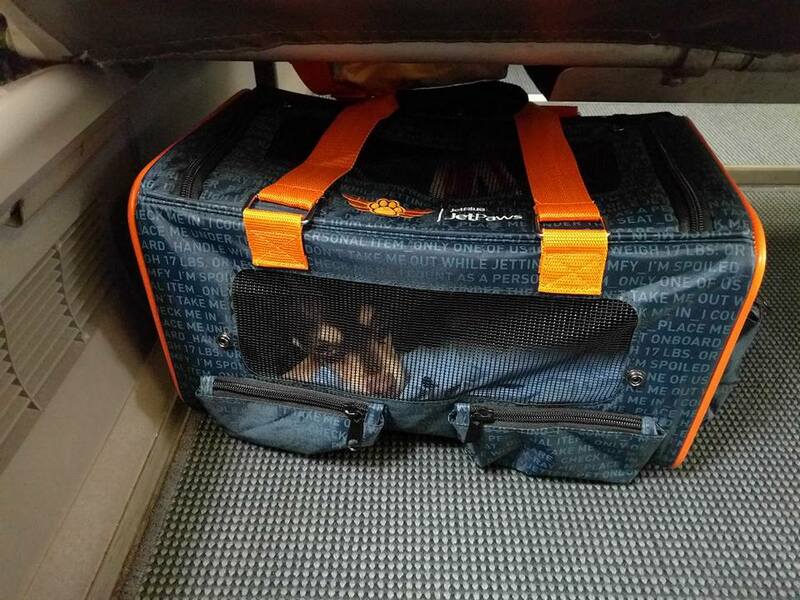 Speaking of, Halley was very excited to show off her SMARTA skills! 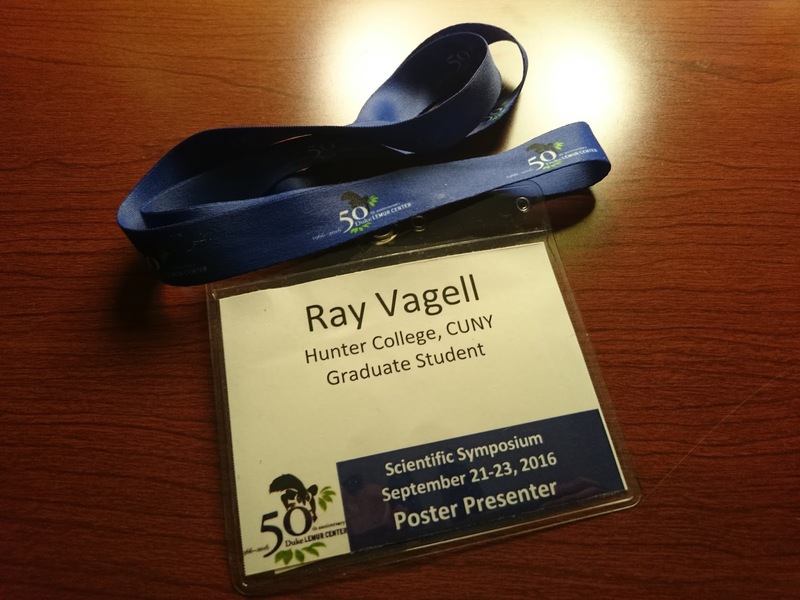 I enjoyed the scientific symposium tremendously. What a great gathering of lemur scientists and lemur lovers. 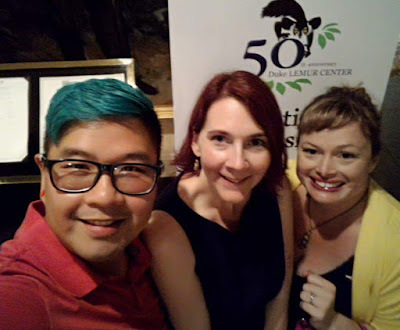 Great job Duke Lemur Center staff for organizing and working this event! 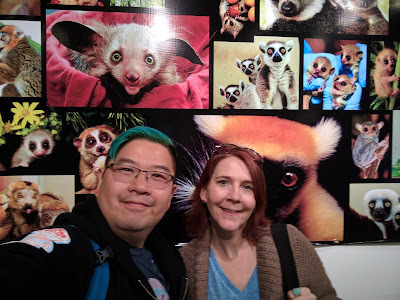 I'm also very excited to have won the "Duke Lemur Center Mystery Bag" from the raffle as well as winning two auction bids: A personalized animal portrait from Julie Byrne (talented artist and Duke Lemur Center volunteer) and TWELVE(!!!) bottles of Loire Valley Wines from Rabelais Wines. 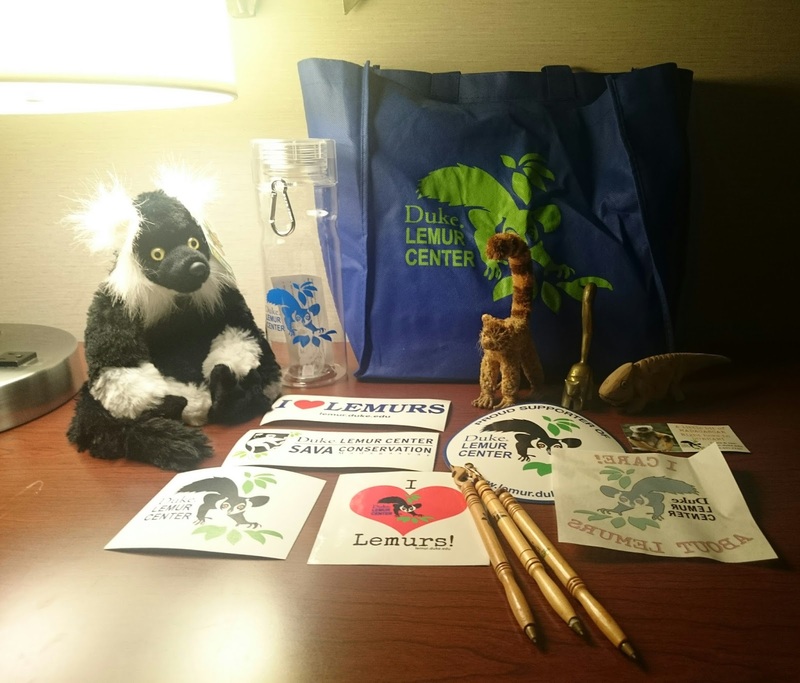 Content of the Duke Lemur Center Mystery Bag. 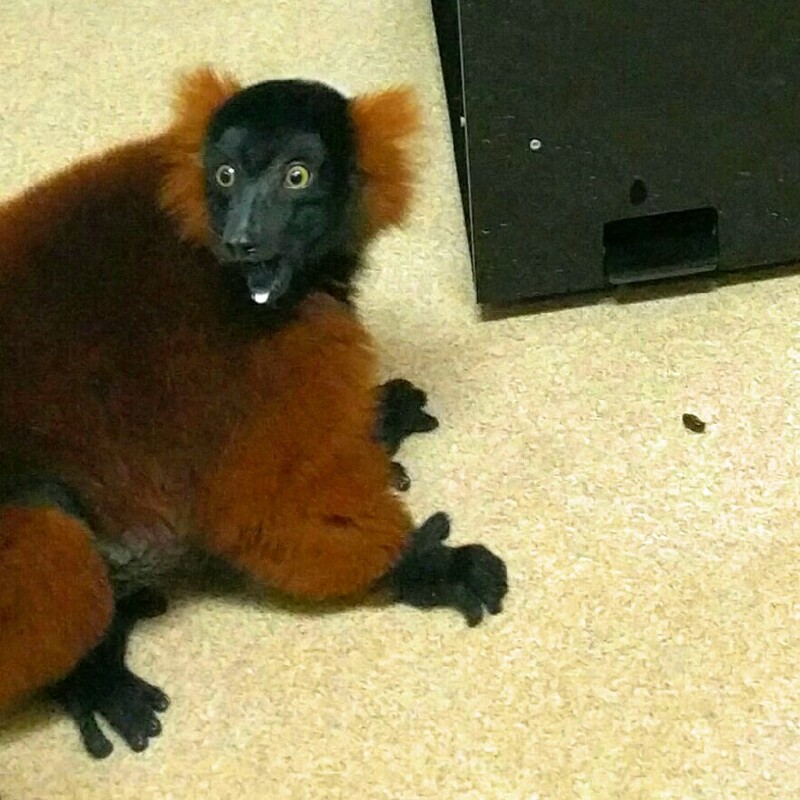 There's a ruffed lemur inside!!! Good News: I Got The Grant! You guys! I got some exciting news to share. I'm elated to share with you, my readers, that I am the recipient of Duke Lemur Center's Director's Fund for Fall 2016! OMG!!! I feel like an adult right now (don't laugh!). I submitted a proposal to fund the remainder of the cost of my research project as well as money to build more of my testing apparatus. As some of you might know, this research project has been going on for unexpectedly long. Though, I am not complaining because I am having fun working with the lemurs and the staff at Duke Lemur Center. Special shout out to my team of research assistants. Without them, this project would not be possible. 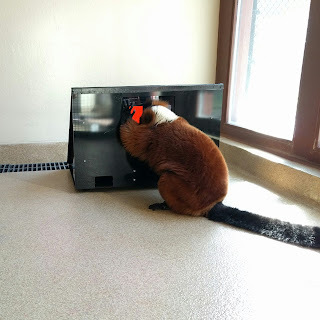 Duke Lemur Center Spring 2016 Newsletter: Do You See What I See? 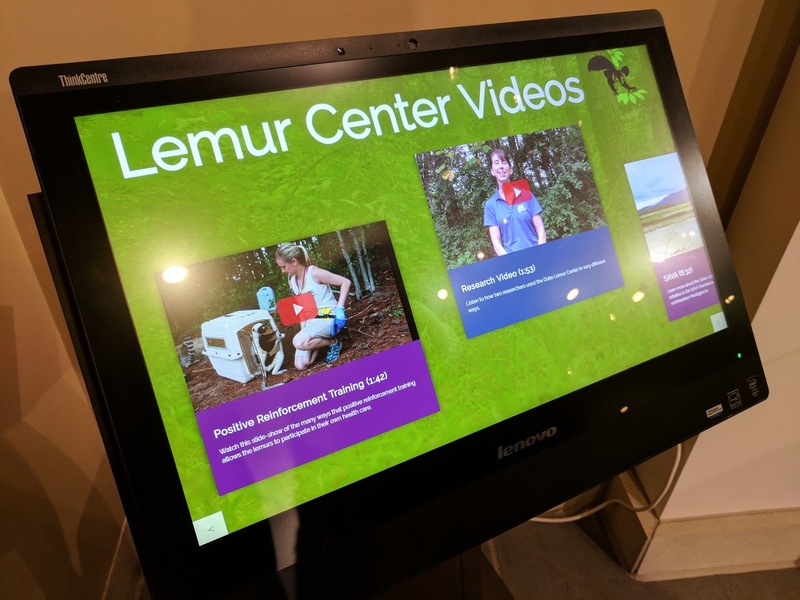 I'm still training and collecting data with the ruffed lemurs, more accurately, my assistants are still training and collecting data with the ruffed lemurs. After a minor hiccup with data collection (which I rather not discuss), I am back to square one collecting my color vision data. 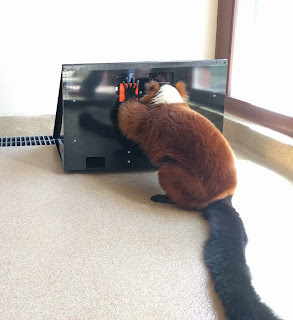 Unfortunately, all of the lemurs that had previous did testing trials seemed to had forgotten how to use SMARTA so we had to re-train them again. Well, everyone except Halley. Yes, Halley, the black and white ruffed lemur. My pride and joy Halley. She had last used the SMARTA over 6 months ago and when I set that apparatus right in front of her, she remembered where she had left off. At the moment, Halley and Pandora are currently taking a break from my study because ... THEY GAVE BIRTH OVER A MONTH AGO! Halley gave birth to 2 boys (Cosmo and Astro) while Pandora gave birth to a boy (Kalani) and a girl (Sally). 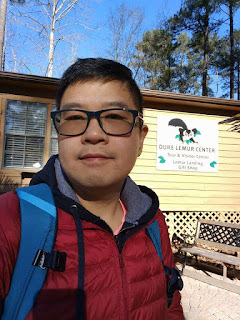 I gave a 30 minute presentation on Tuesday at Duke Lemur Center this week for their "Lemurs, Science, and Beer" seminar. The title of the talk is "Do You See What I See? Studying Ruffed Lemur (Varecia spp.) 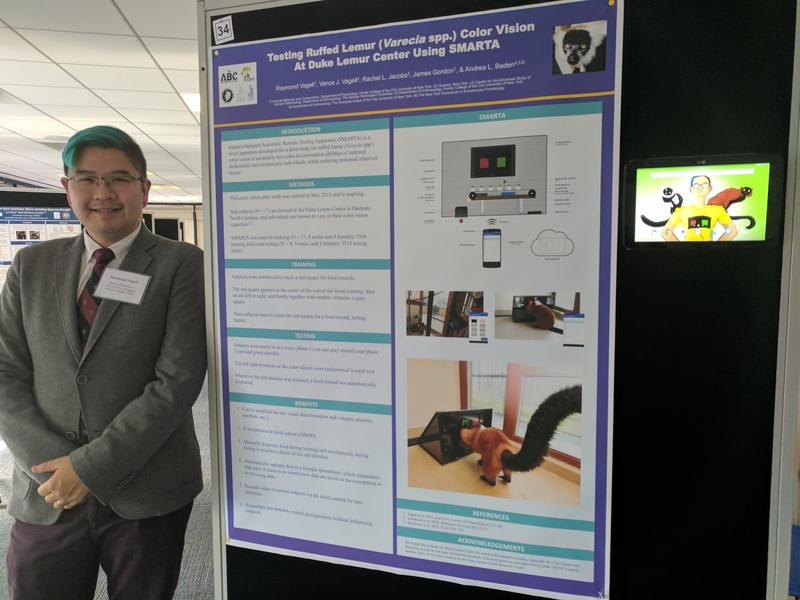 Color Vision using SMARTA". In this presentation, I did a brief talk about how color vision came to be and what the world might look like for ruffed lemurs if they cannot see red or if they can see red. 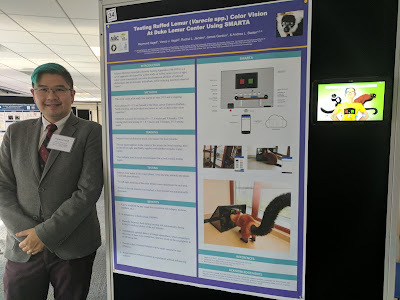 Then, I talked about my research questions and how I try to answer them by using SMARTA. 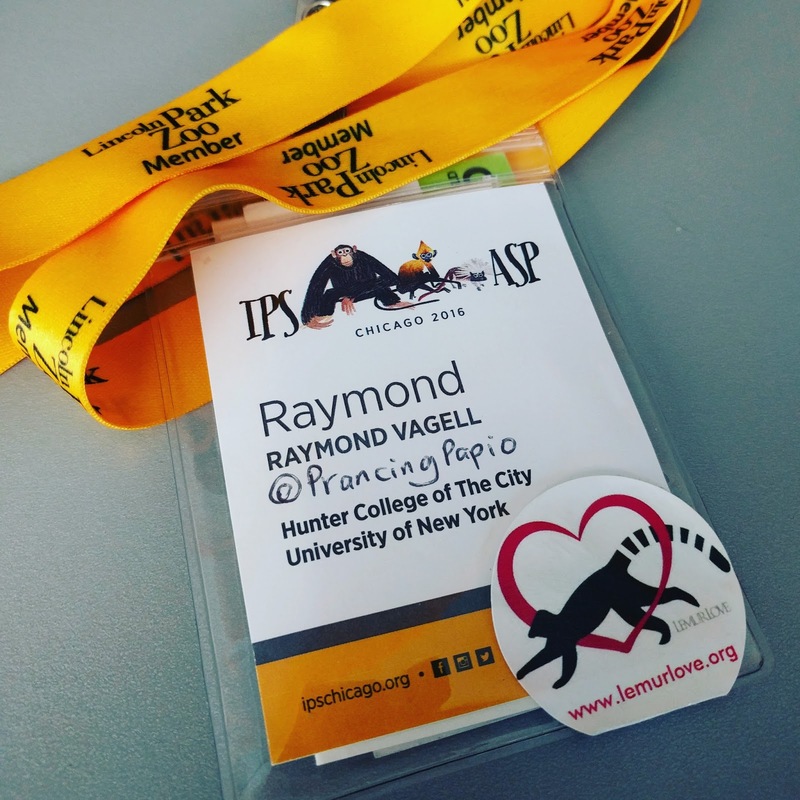 Hey, I know this Raymond Vagell guy! 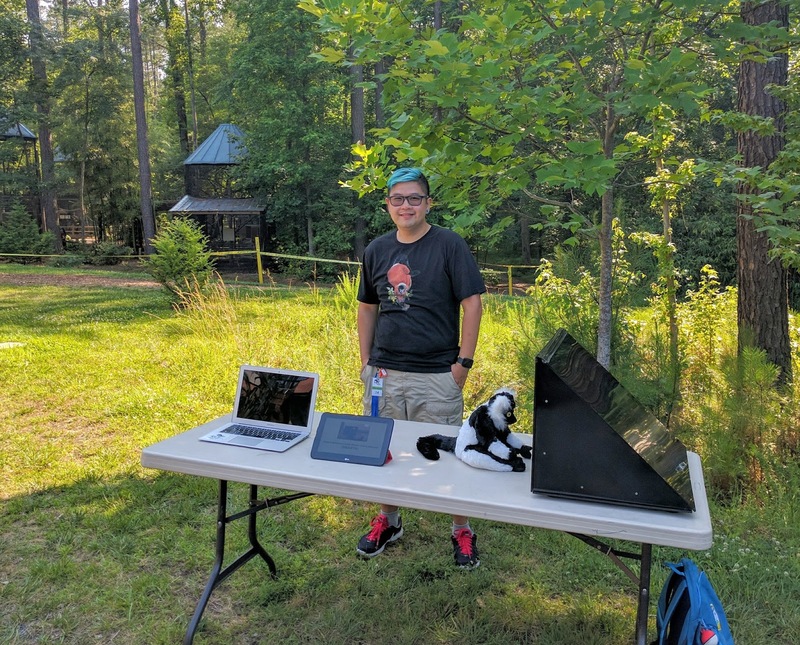 The event had a great turn out. 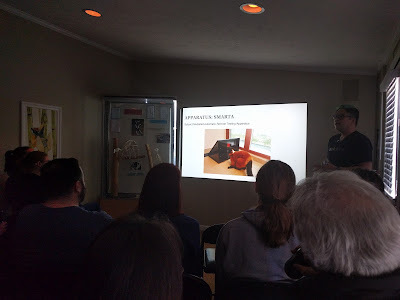 It even attracted a few public attendees as I had advertised the talk on Facebook and Twitter. I'm glad that I was able to talk about what SMARTA is and how it is used to study ruffed lemur color vision to the DLC staff because they've seen me conducting my research but probably doesn't really know what I'm doing. Thanks to all my friends who came to support me. 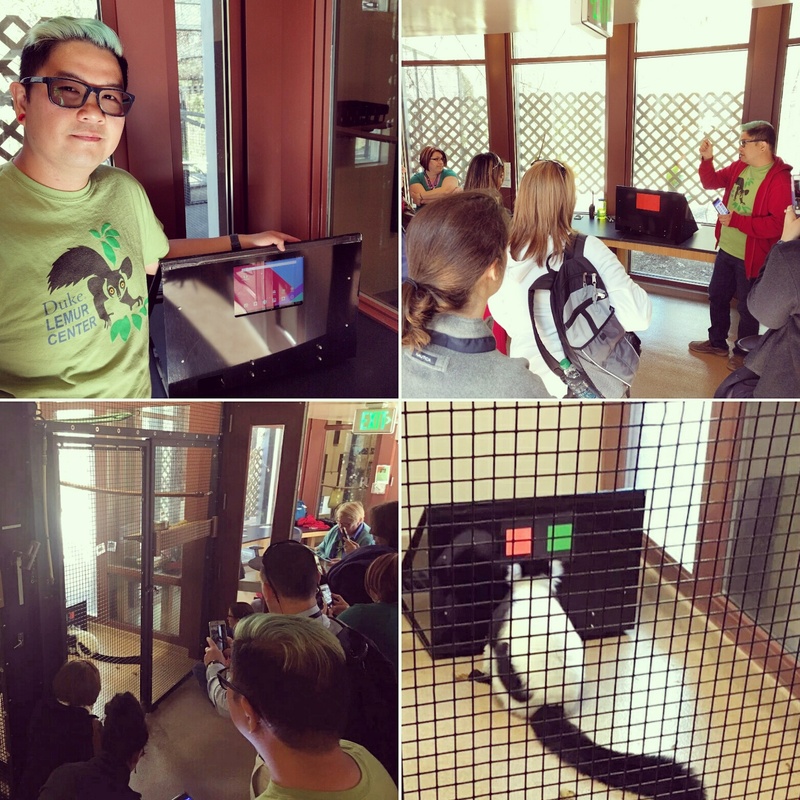 On Wednesday, I had the opportunity to talk about SMARTA and ruffed lemur color vision to Scaling Stem participants who came to visit DLC. I talked about how SMARTA came to be and how it was built. Then, I showed the participants how SMARTA works. Because this is a women in STEM group, it was apropos to have Halley demonstrate how SMARTA works. Without skipping a beat, Halley did her color vision trials perfectly and her enthusiasm wow-ed the crowd. On Thursday, I gave a brief talk to a group of college freshmen that are interested in animal cognition studies. 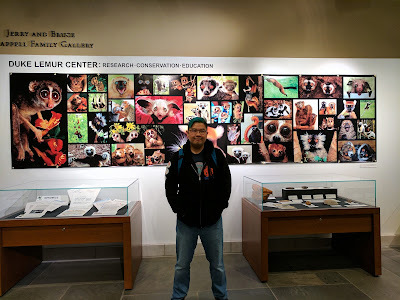 Though the talk was brief, I was able to share some tips on designing animal studies and things to expect when working with animals. This time, Carme helped demonstrate SMARTA. She also wow-ed the crowd with her cognitive skills in discrimination tasks. This has been a long week! But, I am glad that I was given the opportunity to talk about my research and sharing my stories not only to the DLC staff, but also to educators and students. This week is also my last week at DLC for awhile. I am flying back to NYC and will be back to DLC periodically until the study is done around August. My assistant will be continuing this study while I am away. 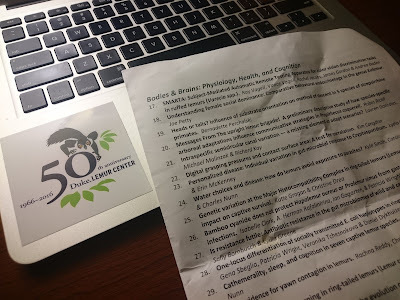 Thanks to Dr. Erin Ehmke for giving me the opportunities to share my work with the DLC family, educators and students. Come join me on Tuesday, April 5th at 4PM where I will be presenting a talk on my ruffed lemur color vision study titled "Do You See What I See? 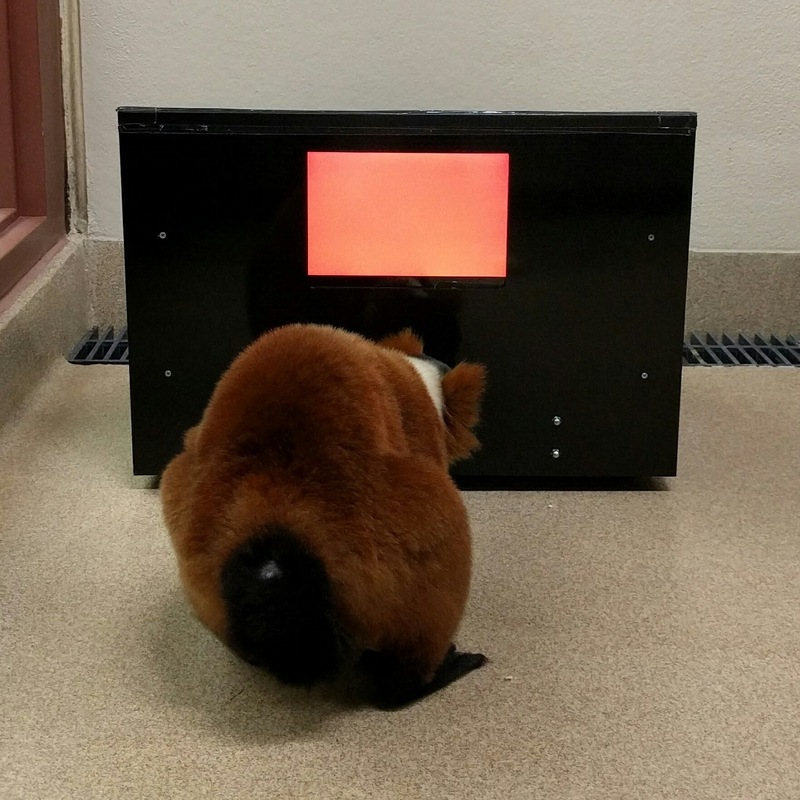 Studying Ruffed Lemur Color Vision using SMARTA. 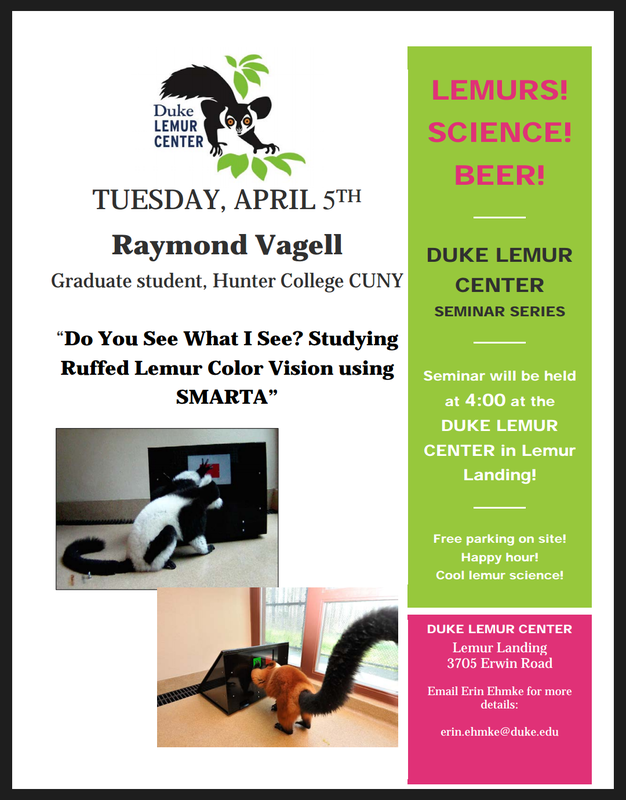 I will talk about the ruffed lemurs and their color vision, what SMARTA is, as well as how this study is conducted. 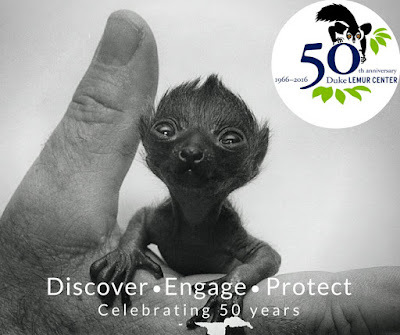 This event is open to the public and will be held at Duke Lemur Center in Lemur Landing (where the gift store is). 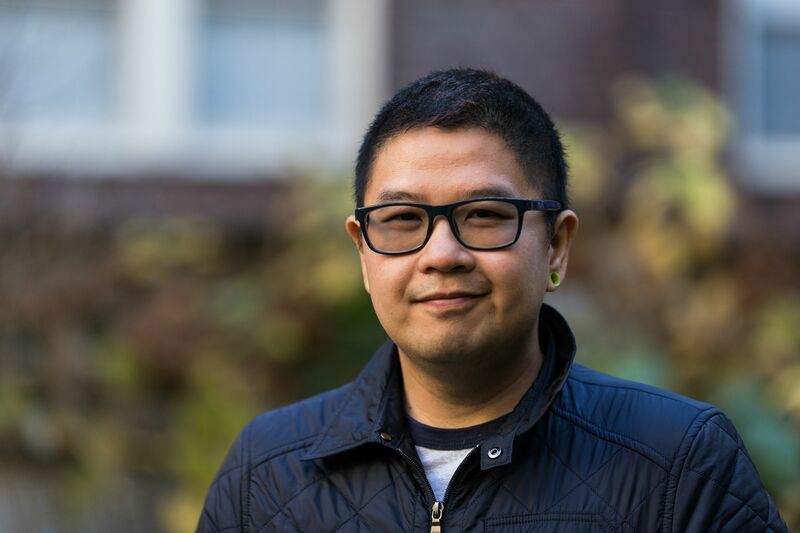 I've started a Facebook event for this talk. 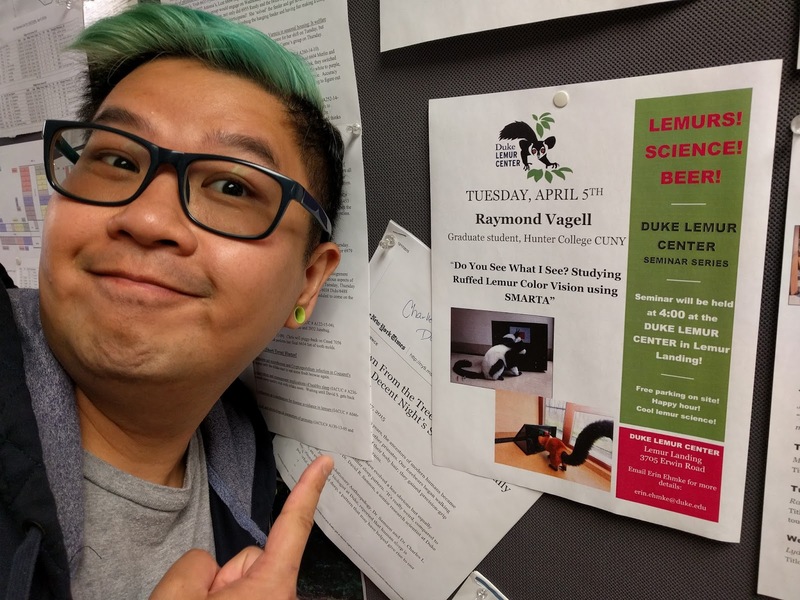 Hope to see you all there! 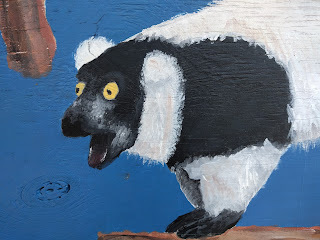 Lemur Landing is directly right in front of the parking lot. It's been a few weeks since my previous post. We are still working with Carme, Pyxis, Celeste, and Pandora. Next week, we will be working with a new female. Great progress with Carme. Pyxis ... not so much. Celeste and Pandora are both starting to touch the screen so it's heading to the right direction. Carme had improved tremendously since my last post. 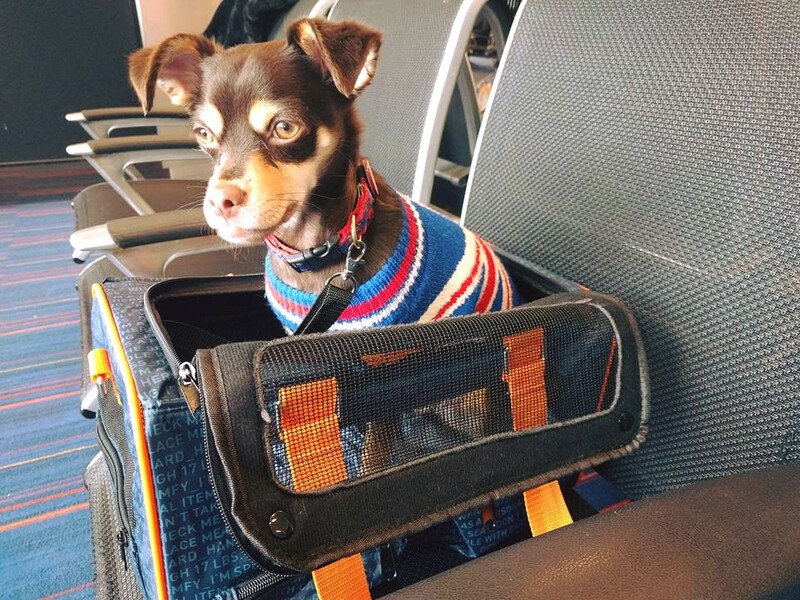 We have been training her daily to reinforce her to correctly station in front of SMARTA and to touch the squares deliberately instead of nonchalantly putting her hands between the squares or just touching the sides of the square. 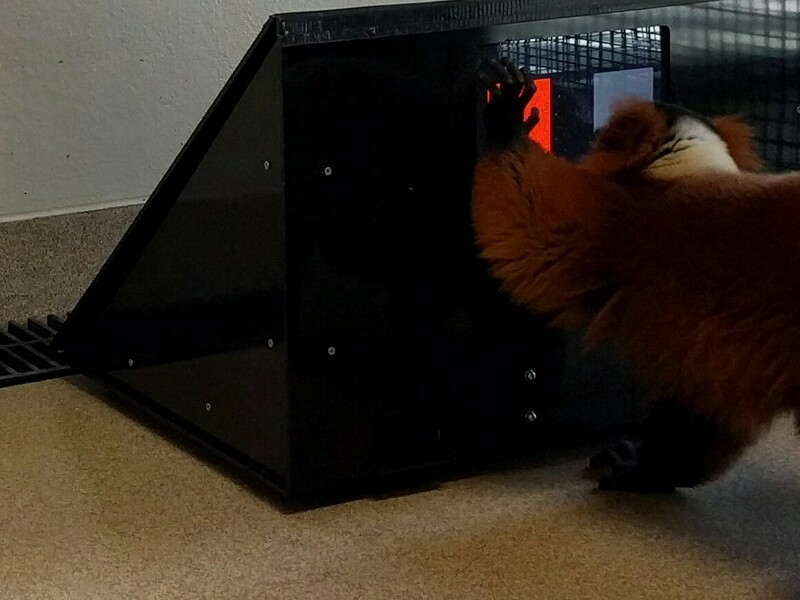 We also turn off the screen for a few seconds when she touches the incorrect stimuli or when we want to extinguish a certain behavior. It seem to have helped and by early this week, Carme is less frantic when using SMARTA and very rarely is swiping her hands all around the screen. When she make an incorrect choice, sometimes she gets a bit frantic but generally a major improvement than what she used to be a few weeks back. 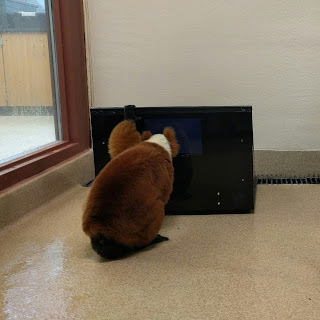 We thought that turning the screen off and turning it back on when she's paying attention to the screen helps to teach her that when she makes a mistake, it will take a few seconds before she can try to get a craisin. Of course, you don't want to turn off the screen for too long or it would stress the animal out. 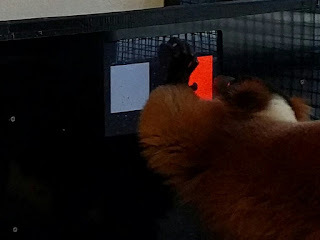 We generally turn it off for less than 5 seconds unless the animal is not paying attention to the screen (eg. looking at another animal, listening to alarm calls, etc). By the end of next week, Carme will be done with the study as she would have done enough sessions for my data collection. I have enjoyed working with her. While she was a bit challenging to work with earlier on, and that she had a lot of behaviors that we had to extinguished, she was such a fun participant.